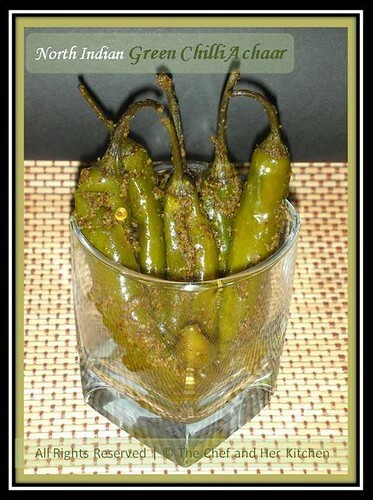 When I posted this post, most of you have liked this chilli pickle along with the paratha I posted and some of you have even requested for the recipe.Actually this pickle is not prepared by me and this is prepared by my MIL. Do I need to say anything about Andhra people's love for Pickles?As she has spent most of her life in Delhi(almost more than 30 yrs) she has expertise even in North Indian pickles .Every year she will prepare a big batch of pickles for us which includes atleast 8-10 different varieties of pickles.This is one of the pickles which I brought back during my last visit to hyderabad.I have asked myMIL for the recipe and have noted it in my notebook to share the treasure with you guys. Even though hubby is not a big fan of Andhra pickles he likes all these North Indian Achaar's as they are less spicy, more tangy and the special flavor induced by mustard oil.It makes a good accompaniment for roti's,paratha's and sometimes we like to eat it even with simple curd rice. Wash the green chillies neatly and pat dry them completely.Make a slit in the centre lengthwise to all the green chillies. Dry roast saunf and methi separately until slight aroma starts.Do not over roast it.Cool them and grind it to a fine powder. In a wide bottomed vessel mix mustard powder,turmeric,amchur,salt to the above mixture and mix everything well until all the masala's are evenly incorporated. Now add mustard oil to the above mixture by mixing it constantly until the complete mixture is properly wet(do no add more oil now). Stuff the mixture into the slit green chillies and keep aside.Mix the remaining mixture into the green chillies and add mustard oil slightly more than the level of green chillies and keep it in air-tight containers or the traditional glass/porcelain jars. Add vinegar to it and mix properly. Keep the jars(covered with lid) in sun for 2-3 days. Serve it with Roti's/Paratha's and Biriyani's as a accompaniment along with raitha. Wish to have a bite,really! I have tasted and made this pickle several times though I add lemon instead of vinegar as I am not so fond of it. It's an absolute delight with hot ghee made paratha. Yes Delhi people will make their paratha only in ghee. Mouth's watering....? Oh one of my fav. north indian pickle apart from the mixed veggie one.Mouthwatering pics..
Mustard oil gives a nice flavor to these pickles. I love kuccha which is a typical bihari mango pickle..aaah..I miss my Uni days..Green chilli Achar looks tempting Prathy..
hey ..Slurp ..Mouth watering girl ..Looking Awesome ..
OMG How can you tempt me like this every time simply superb looks great prathibha ummmmm mouthwatering. Oh i love this pickle, never had guts to try this at home :( kudos to you for making this at home! @parita,I did not make this dear.My MIL made it. @Pari,@Sush All those acts like preservative,but taste definitely differs.Adding AMchur really makes the differnce sush,try it out. @Mangala Thanks for tring my rava dosa dear n glad to know that the results were also nice. Beautiful looking Pickle! Must have tasted awesome... Never tried N.I Pickles so far..
Wow that looks awesome. Looks so tempting and yummy. Droolworthy. Oh thanks so much prathy... will note it down... sure will try it out soon and link back it to you dear. Pickles looks so tempting and mouthwatering ..
Lovely pickles! I love to have with curd rice! I am drooling over the pictures..I am an huge pickle fan..I dont even need paratha..I will have this without anything..
Woww prathy just mouthwatering here..send me some yaar! !am really craving for these spicy pickles..
Those are looking really "hot". Grt !! My FIL and hubby are great fans of this!! That's one lovely pickle. Nice and spicy. i absolutely love picles..can have a bottle full for dinner!! lol...but always thinks that its too tough to make and will keep it for the mommies and jusst borrow a bottle from my mommy. liked ur recipe, will have to muster the courage to try it out now. That achaar looks so good. OMG OMG the very look of it is making me drool, really my mouth is watering sooooo bad!!!!!! The pickles look spicy and yum, have never tried north Indian style pickles but this one sounds like something one should not miss trying! Never heard of this before. SOunds like a perfect dish for a "hot and spicy" food lover like me. 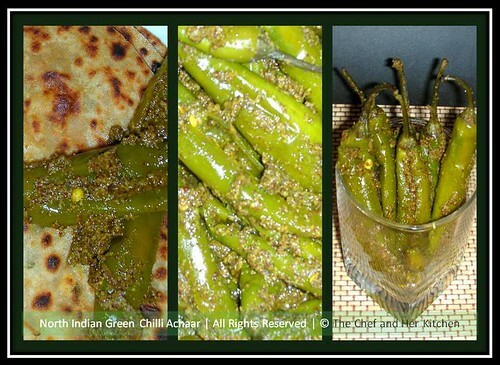 Hot and spicy,love the achaar! WOW, this looks super delicious( I love spicy stuff) Thanks for the recipe! I love pickles...these look so yummy! One of my fav Pickles...been searching for dis recipe from long time....Finally found it here..I tried this jst now and waiting to taste it after 3 days....Cant wait to bite in it :)Thanks for the recipe dear...do u have the mixed veg pickle? I meant leveled cup,not leveled salt..anyways thanks for pointing,updated the recipe.I used regular table salt for the recipe. I always wanted to make this pickle at home but never ahd the recipe. So I was so happy to find the recipe here. I made the pickle following your instructions carefully. It has come out very well. It just needs some more time to rest and flavours to mature, can't thank you enough for this lovely recipe. I have been seeing and tasting this green chilli pickle since I was in 6th std in a boarding school. Never thought it is not very difficult to prepare it. I love it.. I will prepare it soon... :) Thank you, I am so tempted to make it..
@vara..u can store it for over an year if made and handled carefully. I have a question. Which chilli we need to use? Bajji chilli (which we use for mirchi bajji) or normal chilli (big size) which we use in currys? for the green chilly pickle u have mentioned 1/2 cup mustard seeds pls specify in grms which will give a clear picture regarding the quantity. I have tried this recipe twice but it did not work. firstly, a cup salt was too salty. second attempt with half a cup salt it came out soft and unappetizing. I would really like to get it right please help - what am I doing wrong? the amount of salt is the spoiler of this recipe. a levelled cup makes it too salty and reduced quantity makes it really bad and soft. I really would like to get it right as it looks appetizing, please help.